Yesterday I went along to the EduWiki Conference 2014 conference in Edinburgh organised by Wikimedia UK. A really interesting day included presentations about how wikipedia is being used in education (mostly tertiary) and a great discussion of how support for using Wikipedia in schools could be developed. Like, I guess, most primary teacher I used wikipedia a fair bit, and bless simple.wikipedia.org, aimed at learners of english provides articles using Simple English using the 1000 most common and basic words in English. A great resource for younger pupils or pupils who prefer simpler english. However I know I only scratch the surface of Wikipedia. Along with my colleague Ian Stuart I’ve talked to a few Wikimedians at various events recently and always learn something new. From the school education perspective the talk by Martin Poulter, @mlpoulter, former Wikimedia Ambassador at Jisc, was really valuable, his premise was that for academics it was well worth looking under the bonnet of Wikipedia. This was not some terrifying code view of articles but just using some of the tools on Wikipedia pages. Wikipedia pages are available in different languages listed at the bottom of the left sidebar. These could : give different perspectives, eg looking at the different language versions of the Gaza Strip page illustrates different points of view. These pages can also be used by pupils studying languages. Each Wikipedia pages has a link to a Talk page, there you will find discussion of the article and get a measure of how much discussion and work has gone on behind the scenes. The article may be rated for quality & importance. There may be links to a project1 that helps organise the page. Some pages Talk pages, example, may show that they are a Featured Article you can then click a link to show Article milestones which shows the progress of the article quality. Back on the article pages you can find the contributors by clicking view History, then Revision History Statistics, you could also look at Page View Stats these have more statistics and graphs than anyone could want. I don’t think you would want to visit these pages every time you look at a Wikipedia article in class but they are useful to know about. With older pupils and tertiary level students it can demonstrate the huge audience you could gain by editing Wikipedia. After looking at a page Martin took us the Wikipedia Main Page asking how many people had never seen it a surprising number of hands were raised. The Main page lists sister projects2 & other good stuff, seldom visited for example the Featured Content page. Featured content represents the best that Wikipedia has to offer. These are the articles, pictures, and other contributions that showcase the polished result of the collaborative efforts that drive Wikipedia. All featured content undergoes a thorough review process to ensure that it meets the highest standards, and can serve as the best example of our end goals. It would be well worth projecting the main Wikipedia page in class now and then for a look or looking at he main page of some of the sister projects, perhaps the word of the day or species of the week. 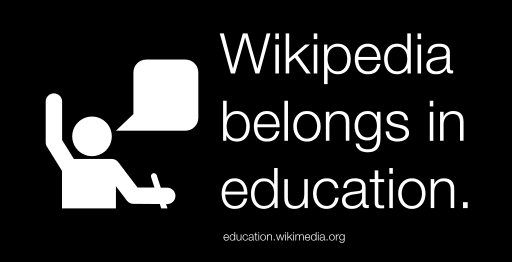 On twitter Martin posted a couple of other resources: Ten Ways Educators Can Use Wikipedia & the Education Brochures both of which look like they are worth exploring. You can get some idea of how interesting the rest of the day and conference were from the #eduwiki tweets, I used Martian Hawsksey’s tools to create an archive and an exploratory view.